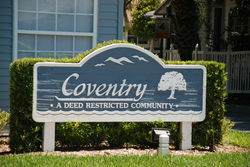 Coventry is a small well-kept community located in Longwood off EE Williamson Road. The community consists of single story townhome and duplex style homes. There is a community pool and lighted tennis courts. Shopping and restaurants are nearby along SR 434 to the south and Lake Mary Boulevard to the north. Access to I-4 is excellent via the SR 434 and I-4 interchange.